The Bf109E introduced the DB601 inverted V-12 engine with direct fuel injection. This new version was vastly superior to the early Jumo powered 109's and was built in large numbers and by the time of the Battle of Britain in 1940, it was the Luftwaffe's main fighter. 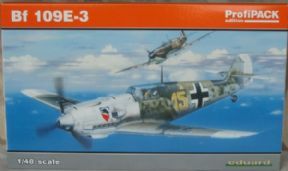 The E-3 was the first Bf109 to carry 20mm cannons in the wings. Eduard are a Czech based manufacturer famed for their model accessories. They have in the last few years released a successful range of kits. Their Profipacks contain a kit with several marking options, along with a Colour Zoom etch set, Canopy Mask and a full colour instruction booklet. This kit has highly detailed and not for beginners. There are markings for 5 different planes of 1940-41, including one plane flown by the famous ace Josef Priller.